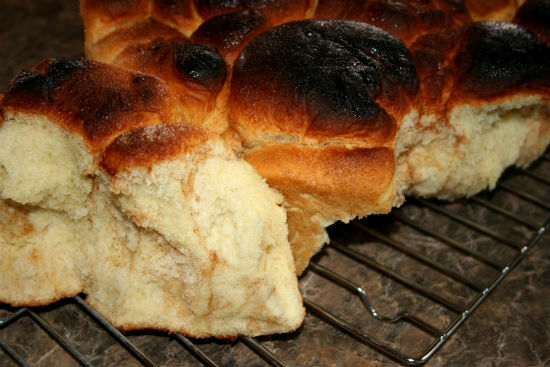 MarksBlackPot: Dutch Oven Recipes and Cooking: Monkey Bread! This weekend was our church's televised conference weekend. That means we Mormons don't go to church to listen to our local leaders, but instead watch our global leaders speak on TV. It's a great family time, as we all sit on our couch and watch. It's also a great time for food traditions, and one of ours is that we make Cinnamon buns, in the dutch oven. But this year, after conference, we were going to an Easter party, and there would be a lot of people, so I thought it would be better to make Monkey Bread. That's basically the same thing as a cinnamon roll, but it's smaller, so more people can get a portion. Many people make Monkey bread by taking canned "pop up" biscuits and rolling them in cinnamon sugar. Then you stack them randomly in your dutch oven and bake them. That's easy enough, but I love making things from scratch, so I jumped in and did it. I also love yeast bread, so I did it that way. First, I activated the yeast by stirring it into the water in a cup. While that was getting all bubbly, I mixed, in a bowl, all of the dry ingredients, but only about 4 cups of the flour to start. I sifted the flour. I've gotten into the habit of doing that. It aerates the flour, and I think it's a bit lighter as a result. Finally, I added the eggs and the yeast mixture. I stirred it all together, then turned it out onto our floured countertop and kneaded until I got a good windowpane. Once it was all kneaded, I set it aside to raise. In about two hours, it was nicely raised. I mixed some sugar into the cinnamon until it looked like a nice blend and it tasted right. 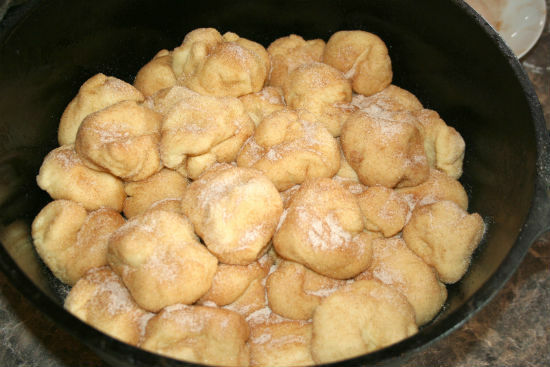 I started pinching off doughballs that were about the size of ping-pong balls, rolled them in the cinnamon sugar and put them into the oiled dutch oven. I don't worry much about the placement, just scatter them evenly. After putting them in, I sprinkled the rest of the cinnamon sugar over the top. Once the doughballs were done, I started up some coals, and when those were getting white, I put a lot of them (25-30) on the lid of the dutch oven to pre-heat. That was heating while the dough was raising a second time in the body of the dutch oven. Once they both were ready, I put the dutch oven out on (and under) the right amount of coals and baked them for about an hour. I use the thermometer, and got them to the 190-200 range. It got a little burned on top. I wonder if that was the sugar. They were sure yummy, and everyone at the party loved them. That bread sounds yummy. Good job!